At night time, the art on the corner of Clay and La Branch glows with bright colors and I’ve looped around the block many times at the request of my kids. During daytime, we decided to visit this park again. 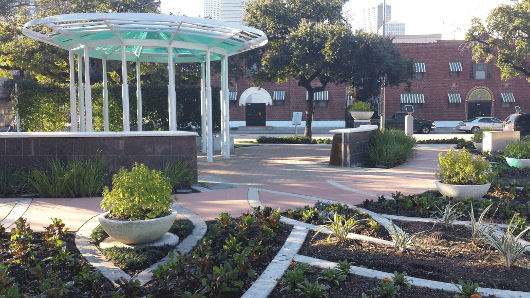 Root Memorial Square is right across from the Toyota Center and is just a few blocks from Discovery Green. Metered Street parking is available (and is free after 6:00pm and on Sunday). Downtown is one of my very favorite districts in Houston. I feel more comfortable on urban streets than on a secluded trail. That said, I only like places that have a lot of pedestrian traffic and a lot of people watching out for each other. I really wasn’t sure about the pedestrian traffic and safety at Root Memorial Square but I was (very) pleasantly surprised. Root Memorial Square is very nicely maintained with fresh gardens and nice walkways. There is a gazebo and a guard shack with a security guard and balls that can be checked out. Right in the middle, sunk down from the street, is a large basket ball court. I wish that court was more visible from the street, for safety, but the design does keep the balls out of traffic. 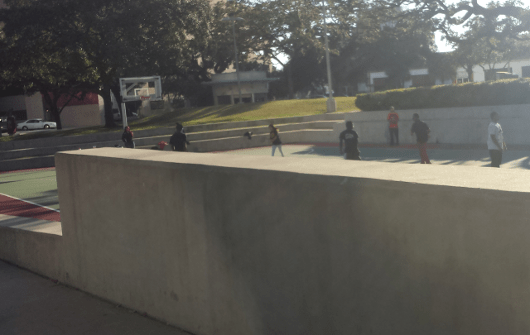 The court is also great for attracting people to the park. When we visited, lots of people were playing ball and several others were watching. My kids had fun running around the sidewalks, playing make-believe in the gazebo and getting dangerously close to the edge of the retaining walls. I liked finding a great urban green space in the shadows of skyscrapers. 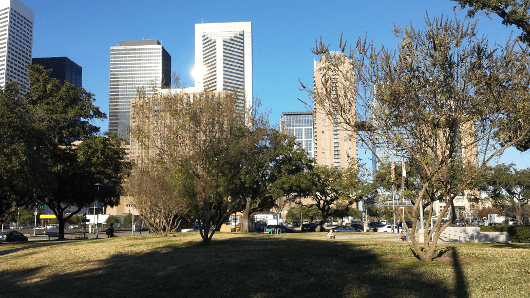 There are no restrooms at the park, but Discovery Green (and the restrooms) are not too far away. This park is small and does not take much time to explore. 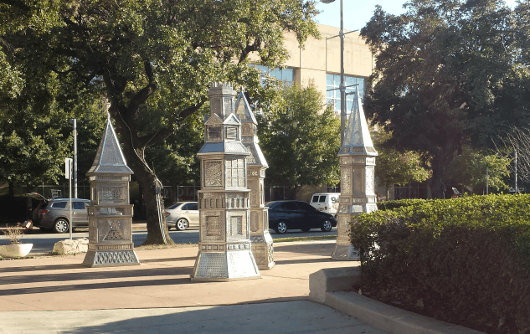 Next time you are in Downtown, swing by and check it out!